Local Indie-pop artist Miya Folick has joined the artist lineup for “BreatheWatchListenTouch: The Work and Music of Yoko Ono” at Walt Disney Concert Hall, 111 S. Grand Ave., Los Angeles, on Friday, March 22, from 8 to 10 p.m.
Preceded at 6:30 p.m. by “Imagine Grapefruits: An Idea Exchange Market” in various spaces throughout WDCH. Throughout this exceptional evening, both Ono’s art and music will be performed by an ensemble of special guests in a concert-length celebration of her 60-plus-year career. The concert is part of the L.A. Phil’s season-long Fluxus Festival. Songwriter and vocalist Folick is based in Los Angeles. Her music has its roots in a dark corner in the old wooden Los Angeles house to which she moved after a rocky few years studying acting in New York. It was there that she began to channel her early musical inclinations. Half Japanese and half Russian and raised in Santa Ana, as a child Folick made up songs to study for school tests and played taiko in her church group. She started classical voice training as a 10-year-old, fascinated by the complex melodies of Italian and German arias. From this period of isolation grew Folick’s ability, developed in the ensuing years as her personal community in Los Angeles expanded. Her debut album, “Premonitions,” released on Terrible Records and Interscope, is a fusion of ’90s rock with contemporary pop and hip-hop, an elegant canvas of ambient sonic textures through which Folick’s voice cuts with stark confidence. The album earned praise from Pitchfork, NPR, i-D and more. 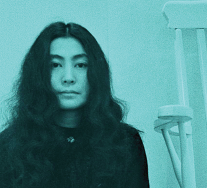 Yoko Ono’s six decades of art and music will be performed by an ensemble of special guests. Ono, 86, is one of the most influential artistic figures of the 20th century. Her work as a performance artist and musician is conceptually bold and politically confrontational, but it’s delivered with a lyrical touch – one informed by her dedication to peace and spirituality – giving it a great sense of warmth and humanity. That warmth has inspired an incredible range of artists and musicians, and continues to resound today. Special guests for this performance also include experimental R&B violinist and vocalist Sudan Archives; singer, songwriter Amber Coffman; Juilliard-trained composer- songwriter Shruti Kumar; La Marisoul, lead singer of Grammy Award-winning Mexican American band La Santa Cecilia; electronic music artist Madame Gandhi; Garbage vocalist Shirley Manson; 2019 Grammy Award winner St. Vincent; choreographer and visual artist Nina McNeely; multifaceted artist and activist Kamil Oshundara; Chilean pop artist Francisca Valenzuela; and 2017 Grammy Award nominees We Are King. Ono herself is not scheduled to perform during the event. Organizers said Ono and her archivist have signed off on every artist and every song, and she will attend if her schedule permits. For tickets and more information, visit www.laphil.com/concertsandevents.